Having trouble with big file attachments bouncing your Outlook email messages? You need OutDisk for Outlook! OutDisk for Windows is the easiest way to share big files through email. Just choose the file(s) you want to send using the OutDisk toolbar button. OutDisk for Windows will automatically upload your files to an ftp server and insert the links into your email. ...... Does your ISP strip zip files? Are your file attachments restricted by Outlook? Does your firewall quarantine important email attachments? Then you need OutDisk. 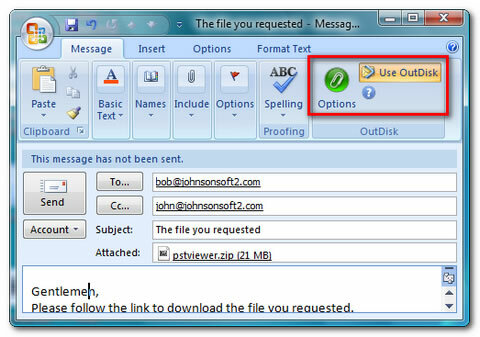 OutDisk for Outlook is the easiest way to share files (big or small) through an email. It was designed to be easy to use: just open an Outlook email message, click on the OutDisk button and select the file(s) you need to send. Compose your email message and then press Send. You may optionally apply zip compression to save disk space, or AES-128 bit encryption to protect your files. When you send your email message, OutDisk automatically uploads your file(s) to an ftp server, and inserts links to the files inside your email. The recipient simply clicks on the link to download the file via http. Qweas is providing links to OutDisk for Windows 1.5.4 as a courtesy, and makes no representations regarding OutDisk for Windows or any other applications or any information related thereto. Any questions, complaints or claims regarding this application OutDisk for Windows 1.5.4 must be directed to the appropriate software vendor. You may click the publisher link of OutDisk for Windows on the top of this page to get more details about the vendor.